First of all, there is the color. That purple-red, deep, gorgeous hue. Second, they are milder than white onions, especially on salads. Third--have you ever roasted red onions? If not, do it, now. Roasted red onion is one of the most delicious veggies you'll ever eat, especially if roasted with a little olive oil, asparagus and mushrooms. Here is another way for you to adore red onions, and I have to say, I've fallen in love; Ferment them. Fermenting onions is simpler than the famed sauerkruat--almost fool-proof, really--and the flavor is unbelievable. When raw, red onions have a sweet flavor, but a definite bite. When fermented, the bite is tamed and you are left with a mildly sweet, subtly sour crunch that can be used as a condiment on many different foods, or eaten plain if you love onions as much as I do. I have made many pints of pickled red onions lately, and have decided I may have to move up to making quarts at a time, because they just don't last long enough for me. However, I want to share my pint recipe with you because it's a smaller commitment. Making a small batch is less intimidating, especially if you've never fermented anything before. I have read from other sources that red onions can be salted and pounded just like sauerkraut, but I think making a brine and pouring it over simplifies the process. If you already love red onions, you are in for a special treat. If you shy away from onions because of their bite and lasting effects, try fermenting them. They become more mellow and in my experience, don't stick around on your breath like raw onions do. 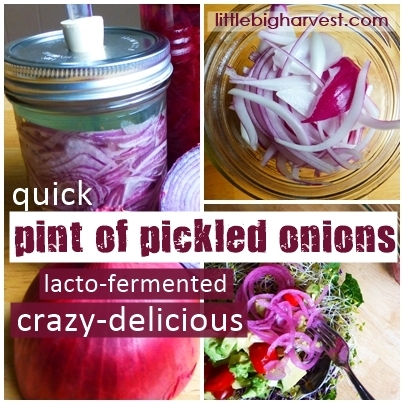 Give this simple ferment recipe a try--you may just fall in love! 1. Start with clean hands, clean counter space, and clean equipment. 2. Slice the onion thinly. The easiest way to do this, in my opinion, is to use a mandoline , but a good knife and steady hand will work just as well. Put the onions directly into the pint jar. 3. In a separate cup or jar, stir the salt and water together. If the salt doesn't dissolve right away, let it sit for awhile and stir again until the salt has completely disappeared. 4. Pour the salt water over the onion. It should be almost the exact amount of water needed, though you may have a little bit left. 5. Press the onions down slightly with a weight to keep them under the brine. There should be an inch of headspace between the top of the brine and the top of the jar--if not, remove some of the brine with a spoon. 6. 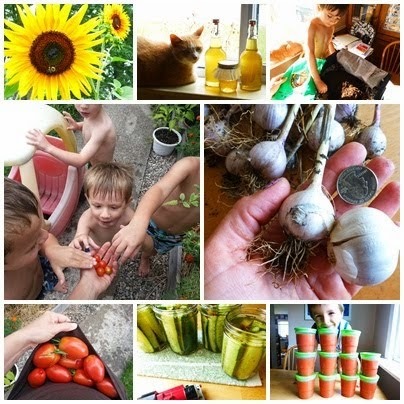 Place a lid on the jar (use a regular canning jar lid, or a lid with airlock) and put in a place that doesn't get direct sunlight or extreme temperatures. If not using an airlock, make sure to burp the jar by loosening the lid a bit every day or every couple of days, to allow gases to escape. Allow to ferment for a week, looking at the jar daily to make sure the brine hasn't overflowed (if it has, remove excess brine with a spoon until you have an inch of headspace, and wipe rim of jar/lid with a clean towel before replacing lid). 7. In most cases, a week is enough time to give you delicious pickled onions, but you can ferment them as long as you want. The three-week mark is usually my favorite. The longer they ferment, the more sour they will become. When the flavor is to your liking, place the pint jar in the fridge (remove airlock first if you used one) and marvel at how quickly the delicious onions disappear when you start digging in! Don't forget to check out fermentools.com (I'm not an affiliate, I just love them). You don't need special equipment for fermenting, but I think having tools takes away some of the intimidation factor. Oh sounds delicious! I am going to try it for sure.. Yes, do! I just ate a spoonful this morning for breakfast on top of soup. I love these onions! Making food forest at roadside is great initiative and I really appreciate it.I really want to contribute in this cause.In fact I am planning to do something like this in my city.